The V-chip is a highly significant part of the discussion about whether television (or broadcasting in general) deserves some special attention in terms of its accessibility to children, its particular power to affect conduct, and its invasiveness. But as this notion of filtering and labeling has caught the imagination of the regulator, the legislator, and all those who wish to consider new ways to alter bargaining over imagery in society, the very idea of the V-chip or its equivalent is moving across other technologies, including the Internet. The V-chip issue has also fueled the ongoing debate about violence and sexual practices in society, and how representations on television relate to those practices. *What research basis is necessary to require a framework for labeling and rating? *What relationship between government and the image-producing industries can be characterized--for constitutional and other reasons--as voluntary as opposed to coercive? *Who should evaluate these images? *To what extent should the evaluation process be centralized and/or distributed? *What assessment is appropriate to evaluate whether the experiment is "successful?" 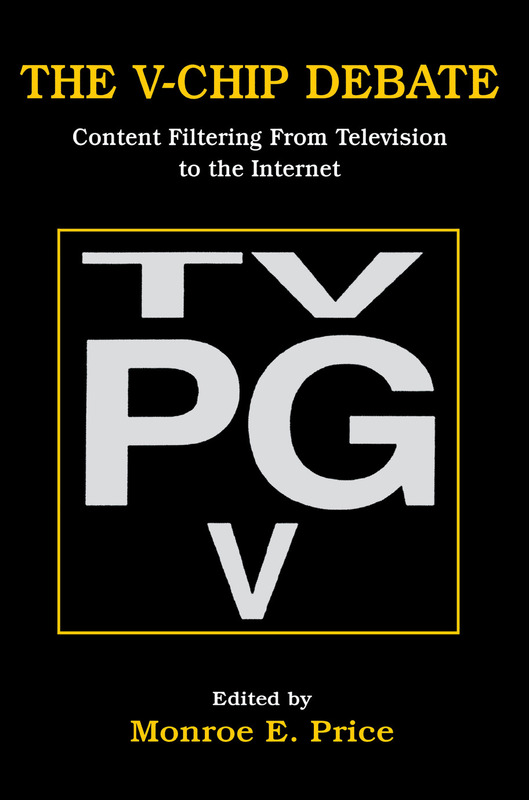 In addition to the V-chip's origin's in Canada and its further evolution in the United States, this book discusses the development of the V-chip and television rating systems in Europe, Australia, and throughout the world. It also includes essays which contrast the very different approaches in Canada and the United States in terms of the role of regulatory agency, industry, and government. "An informative gateway to a host of useful references and resources, this unique book will be appreciated by upper-division undergraduates through professionals." "Those who teach courses in media and society, public interest, or regulatory issues as well as anyone teaching general mass media courses will find that The V-Chip Debate addresses a broad range of perspectives that will surely spark interesting and, hopefully, meaningful class discussions." Contents: M.E. Price, Introduction. Part I:Adopting the V-Chip System: Canada and the U.S. A. MacKay, In Search of Reasonable Solutions: The Canadian Experience With Television Ratings and the V-Chip. S.D. McDowell, C. Maitland, Developing Television Ratings in Canada and the United States: The Perils and Promises of Self-Regulation. M. Heins, Three Questions About Television Ratings. J.M. Balkin, Media Filters and the V-Chip. Part II:Other Perspectives, Other Media. A.M. Hargrave, The V-Chip and Television Ratings: British and European Perspectives. J.T. Federman, Media Ratings Systems: A Comparative Review. J.T. Hamilton, Who Will Rate the Ratings? D.F. Roberts, Media Content Labeling Systems: Informational Advisories or Judgmental Restrictions? C.D. Martin, An Alternative to Government Regulation and Censorship: Content Advisory Systems for Interactive Media. R.M. Mosk, Motion Picture Ratings in the United States. Part III:The Internet Debate. D.J. Weitzner, Yelling "Filter" on the Crowded Net: The Implications of User Control Technologies. J. Weinberg, Rating the Net. Part IV:Appendix. Canada. United States. Europe. M. Gebauer, B. Sherman, Bibliography.